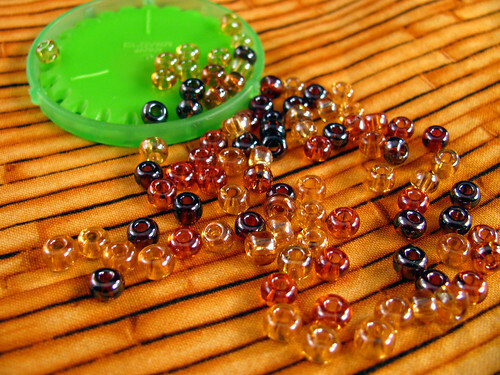 These beads and the background fabric will be going into another yo-yo bag. I wanted to make another bag and desired a more neutral color than the tie-dye yo-yos of my previous bag. I had the beads since Christmas, but hadn’t seen any fabric until yesterday. I think this bamboo print is perfect. Striped fabric makes such interesting yo-yos. This entry was posted on Thursday, February 26th, 2009 at 3:00 am and is filed under Craft and Sewing. Tagged: Craft, Sewing, Yo-Yo. You can feed this entry. You can leave a response, or trackback from your own site.